In this section you will learn how to configure the menus globally, per organization/website, or for your own use only. You also will learn the various kinds of menus in OroCommerce and OroCRM management console and OroCommerce storefront. 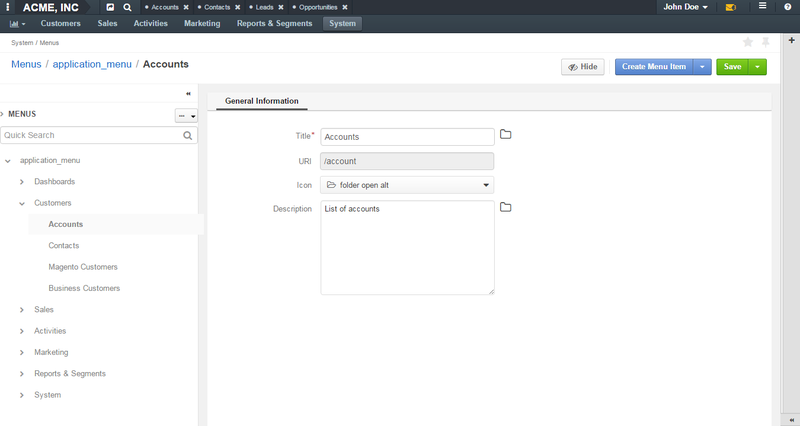 The application_menu is the main menu of the Management Console in Oro application. It resides on the top of every application page and you can use it to navigate through Oro application. Subject to configuration, it may be displayed horizontally or vertically. To toggle the way it is displayed, navigate to the System > Configuration section using the main menu, and open System configuration > General Setup > Display Settings in the panel to the left. In the Navigation Bar section, unselect the Use Default option and select the Top or Left position. In the latter case, the menu items are displayed as icons. For more information, see Main Menu. You can find shortcuts menu in the top panel of the application, next to the organization name. It helps you pin the frequently used actions and have them handy. 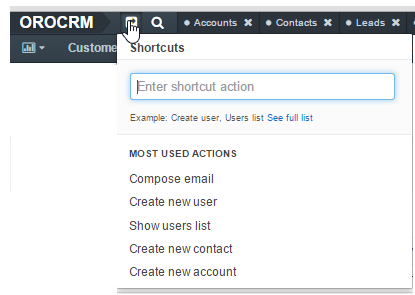 You can launch an action by clicking it in the dynamically generated Most Used Actions list. This list is updated as you are using the system, and will initially contain the actions that you use the most. To access other shortcuts, click See the full list to see complete list of shortcut items or use search: start typing the name of a related entity or an action to choose from a list of matching items. In Management Console, user can access their profile configuration, emails, tasks and events via a usermenu (by clicking on your name on the top right of the application). 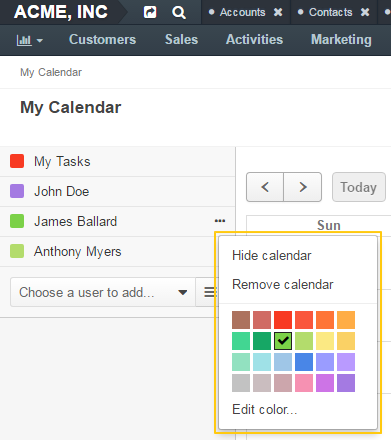 A calendar_menu is a service menu that is used on the My Calendar page and helps to change the displayed calendar color, hide or remove a calendar. The ability to configure menus globally, per organization, and for personal use is controlled by the two capabilities: Manage Menus and Access system configuration. 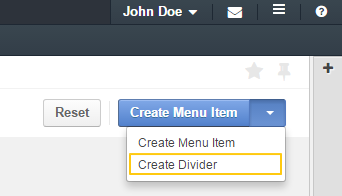 By default, only users with Admin role have these capabilities enabled and may customize menus on all configuration levels. To enable a user to personalise menus for themselves and configure menus for each organization individually, include the Manage Menus capability into the user role. To enable a user to configure menus globally, for all organizations, websites, and users whose configuration fall back to the global settings, both Manage Menus and Access system configuration capabilities should be enabled for the user role. 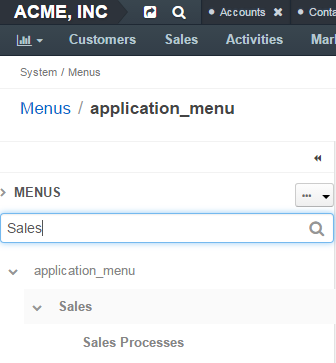 Navigate to the management console menu list by clicking System > Menus in the main menu. Click on the menu you would like to edit. Update the menu contents following the guidelines provided in the Customize a Menu section. The changes apply automatically. This option is available in the Enterprise edition only. 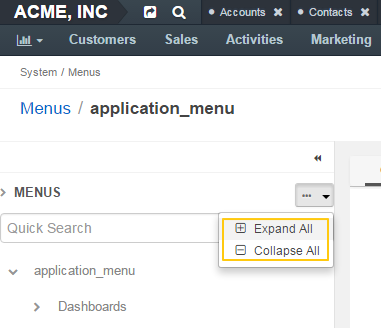 Navigate to the management console menu list by clicking System > User Management > Organizations in the main menu. Click on the organization you would like to edit the menu for. Click on your name at the top right of the page and then click My User to open your profile. Select Edit Menus from the More Actions list at the top right of the page. 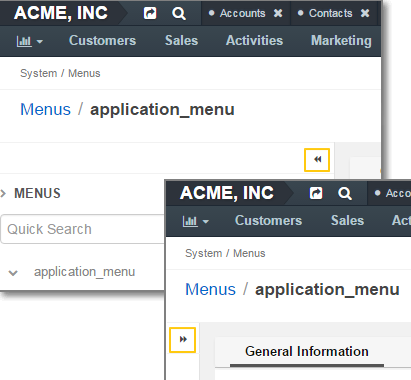 On various configuration levels, the menu and frontend menu list looks the same and the flow for customizing any menu is similar. On the menu list you can see the menus available for review or customization.